A private library is a library under the care of private ownership, in contrast to that of a public institution, and is usually only established for the use of a limited number of people, or even a single person. As with public libraries, stamps, stickers, or embossing are used to show ownership of the items. Some people donate or sell their private libraries to established institutions such as the Library of Congress, or, as is often the case, bequeath them thereto after death through a will. Private libraries often reflect the interests of the owner and the depth of collection in specific area of interests can go far deeper than the level of collection public libraries can attain. For example, Henry Clay Folger developed his personal collection of Shakespeare, which developed into the Folger Shakespeare Library in Washington, D.C. It holds the largest collection of the printed works of William Shakespeare in the world. Almost all early libraries were private or semi-private libraries; the idea of a public library did not emerge until the middle of nineteenth century. The earliest libraries belonged to kings, temples, and other individuals and institutions, and were usually restricted to nobility, aristocracy, scholars, or priests. Examples of the earliest known private libraries include one found in Ugarit (dated to around 1200 B.C.E.) and the Library of Ashurbanipal in Nineveh (near modern Mosul, Iraq), dating back to the seventh century B.C.E..
Until the nineteenth century libraries were private or semi-private, and the idea of a public library with equal and free access to knowledge for all citizens is an invention of late modernity. From antiquity, rulers have controlled knowledge in order to establish social, religious, cultural, and political power. Therefore, access to libraries have historically been strictly limited by those in power; the control of knowledge also helped to preserve social class distinctions. Private libraries also served as archives that held documents of royal families, geneaological charts, private medical records, military histories, and other personal records of the king or ruler. Institutional or corporate libraries also maintain, to varying degrees, proprietary ownership of information; they therefore also limit access to information. Those libraries are funded and maintained by the institution or organization and are tailored to fulfill specific missions and goals. They function as archives and record repositories for various legal and historical documents, including classified information, minutes of business meetings, and financial records. Today people generally view the library as a free book lending institution from their experiences with public and school libraries. Those libraries are funded by taxes or other public funds for the purpose of educating the general public. On the other hand, private libraries are funded by private funding sources. While public and school libraries contain a wide and diverse range of collections, private libraries reflect the owner’s personal interests, tastes, and needs. The collections tend to have a narrow but deep and well developed focus in a specific area. Private libraries for citizens became possible after the invention of the printing press, which allowed individuals to develop personal collections. Unlike public libraries, however, private libraries also include unpublished materials such as the owner's notes, letters, photos, writings, and other records. The private libraries of certain individuals may also act as the basis for a museum. For example, Alfred Nobel’s collection of 1500 volumes of published books and early drafts became the foundation for the Private Library of Alfred Nobel. In some cases, private libraries become the basis upon which to build a public library upon the death of, or by the will of, the owner. For example, after the British burned Washington, D.C. and the Library of Congress in August 1814 during the War of 1812, Thomas Jefferson offered his own collection to the nation. Consisting of over 9,000 volumes, it was organized broadly into three categories: Memory (History), Reason (Philosophy) and Imagination (Fine Arts). In January 1815, Congress accepted his offer, appropriating $23,950 for his 6,487 books, and the foundation was laid for a great national library, the U.S. Library of Congress. Today, the Library of Congress' website for federal legislative information is named THOMAS, in honor of Jefferson. Today, the concept of a private library is broadly applied to any individual’s personal collection regardless of its size. In contrast to public libraries, private libraries include one’s own personal works, letters, diaries, photos, blogs, and other personal materials. Almost all libraries until the nineteenth century were private libraries. Libraries belonged to either a ruler or king and had limited access; they served as both archives and depositories of records. The Library of Ashurbanipal is an example of a private library whose records still exist today. The Royal Library of Ashurbanipal, named after Ashurbanipal(ca. 668-627 B.C.E. ), the last great king of the Neo-Assyrian Empire, is a collection of thousands of clay tablets with cuneiform script, and fragments containing texts of all kinds (royal inscriptions, chronicles, mythological and religious texts, contracts, royal grants and decrees, royal letters, assorted administrative documents, and even what would be today called classified documents, reports from spies, ambassadors, etc.) from the seventh century B.C.E. The materials were found in the archaeological site of Kuyunjik (then ancient Nineveh, capital of Assyria) in northern Mesopotamia. The site would be found in modern day Iraq. It is an archaeological discovery credited to British archaeologist Austen Henry Layard (1817–1894); most texts were taken to England and can now be found in the British Museum. The ancient libraries were actually comprised of several smaller collections. A first discovery was made in late 1849 in the so-called South-West Palace, which was the Royal Palace of king Sennacherib (705 – 681 B.C.E.). Three years later, Hormuzd Rassam, Layard's assistant, discovered a similar "library" in the palace of King Ashurbanipal (668 - 627 B.C.E. ), on the opposite side of the mound. Unfortunately, no record was taken for the findings, and soon after reaching Europe the tablets appeared to have been irreparably mixed with each other and with tablets originating from other sites. Thus, it is almost impossible today to reconstruct the original contents of each of the two main "libraries." The whole set is known as the "Library of Ashurbanipal" as it is known that this king was literate and was a passionate collector of texts and tablets. He believed that the possession of a library would lead to good governance. He hired scholars and scribes to copy texts, mainly from Babylonian sources. Many of these would have been inscribed onto wax boards which because of their organic nature have been lost. The texts were principally written in Akkadian in the cuneiform script. Many of the texts deal with divination, but also with medicine, astronomy and literature. The epic of Gilgamesh, a masterpiece of ancient Babylonian poetry, was also found in the library. The library was destroyed in 612 B.C.E. by the Medes, an ancient Persian race. A great fire may have ravaged the library which caused the clay cuneiform tablets to become partially baked. This act of destruction paradoxically helped with the preservation of the tablets. The British Museum’s collections database counts 30,943 "tablets" in the entire Nineveh library collection, and the Trustees of the Museum propose to issue an updated catalog as part of the Ashurbanipal Library Project. If all smaller fragments that actually belong to the same text are deducted, however, it is likely that the "library" originally included some 10,000 texts in all. The original library documents however, which would have included leather scrolls, wax boards and possibly papyri, contained perhaps a much broader spectrum of knowledge than what we know from the surviving clay tablet cuneiform texts. Nearly every villa (house) of nobility had a library and virtually every one was split into two rooms: one for Latin texts and one for Greek texts. Rome may very well have been the birth place of specialized libraries, with evidence of early medical and legal libraries. In the fifth century B.C.E., on the island of Cos outside the city of Pergamum, a medical school complex with a library was built in the sanctuary of Asclepius. This is the first medical school known to have existed, and subsequently it could be credited with the first specialized library. The Golden Age brought with it a renewed interest in conserving ideas being put forth by the great thinkers of the day. The kings of each European country created impressive libraries some of which have become the national libraries of today. The national library of France in Paris (Bibliotheque Nationale de France) was started in 1367 as the Royal Library of King Charles V. In Florence, Italy, Cosimo de Medici had a private library which formed the basis of the Laurentian Library. The Vatican library was also started in the 1400s. The creation and expansion of universities prompted the gifting of private libraries to university libraries. One notable donation was by Humphrey, Duke of Gloucester to Oxford University in the early 1400s. Private libraries in the hands of individuals have become more numerous with the introduction of paperback books. Nearly every law firm and hospital has a library for use by its employees. In most of the English speaking world these are usually not called private libraries. 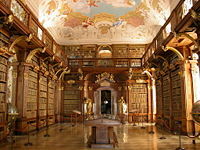 They are normally considered as medical libraries or law libraries. Many large corporations also have a library that covers the distinct industry of said company. Scientific establishments are especially apt to have a library to support the scientists. Manufacturing facilities are also likely to have an engineering library to help with troubleshooting and the assembly of complicated parts. In most of the English speaking world these types of non-public libraries are usually not called private libraries. They are called "Special Libraries" and their staff often seeks advancement and knowledge by joining the Special Libraries Association. Examples of a modern private library include Folger Shakespeare Library by Henry Clay Folger, Huntington Library by Henry E. Huntington, John Carter Brown Library by John Carter Brown, and Morgan Library & Museum by J.P. Morgan. The Folger Shakespeare Library is an independent research library on Capitol Hill in Washington, DC. It has the world's largest collection of the printed works of William Shakespeare, and is a primary repository for rare materials from the early modern period (1500–1750). The library was established by Henry Clay Folger in association with his wife Emily Jordan Folger. It opened in 1932, two years after Folger's death. The library offers advanced scholarly programs, national outreach to K-12 classroom teachers on Shakespeare education, and plays, music, poetry, exhibits, lectures, and family programs. It also has several publications and is a leader in methods of preserving rare materials. Standard Oil of New York president, then chairman of the board, Henry Clay Folger, a Phi Beta Kappa graduate of Amherst College, was an avid collector of Shakespeareana. Toward the end of World War I, he and his wife Emily Jordan Folger began searching for a location for his Shakespeare library. They chose a location adjacent to the Library of Congress in Washington, DC. The land was then occupied by townhouses, and Folger spent several years buying the separate lots. The site was designated for expansion by the Library of Congress, but in 1928 the Congress passed a resolution allowing its use for Folger's project. The cornerstone of the library was laid in 1930, but Folger died soon afterward. The bulk of Folger's fortune was left in trust, with Amherst College as administrator, for the library. Because of the stock market crash of 1929, Folger's estate was smaller than he had planned, although still substantial. Emily Folger, who had worked with her husband on his collection, supplied the funds to complete the project. The library opened on April 23, 1932 (believed to be Shakespeare's birthday). Emily Folger remained involved in its administration until shortly before her death in 1936. The main Folger building was designed by architect Paul Philippe Cret. The white marble exterior includes nine street-level bas-reliefs of scenes from Shakespeare's plays created by the sculptor John Gregory as well as many inscriptions personally selected by Henry Folger. The large Art Deco window and door grilles are aluminum. A second Folger building, the Haskell Center, opened in 2000 across the street from the original building. It houses the library's education and public programs staffs. The Folger grounds include an Elizabethan garden of plantings from Shakespeare's plays or that were commonly used in his day. The large Folger collection of Shakespeare materials is best-known for its 79 copies of the 1623 First Folio as well as many quartos of individual plays. The library also holds the third largest collection of English printed books from before 1641. In all, the library collection includes more than 250,000 books, about 55,000 manuscripts (from Elizabeth I and John Donne to Mark Twain and Walt Whitman), 250,000 playbills, and 50,000 works on paper (including prints and photographs). It also holds many paintings and sculptures, most related to Shakespeare or his plays. Folger Shakespeare Library’s cultural and arts programs include theater, poetry, concerts, exhibitions, and lectures. Folger Theatre performs a three-play season, featuring the works of Shakespeare as well as contemporary plays inspired by his works. Several productions have won a Helen Hayes Award. The Folger Consort, the library's resident early music ensemble, also performs a regular concert program. The annual PEN/Faulkner Award for Fiction readings are performed in the Folger's Elizabethan Theatre. The O. B. Hardison, Jr. Poetry Prize is awarded by the library to a U.S. poet who has published at least one book within the last five years, has made important contributions as a teacher, and is committed to furthering the understanding of poetry. The Folger Institute organizes academic conferences, symposia, and seminars, as well as summer institutes. The Folger education department holds month-long summer institutes on teaching Shakespeare for teachers, as well as workshops around the country. Publications include the Folger Library editions of Shakespeare's plays, the journal Shakespeare Quarterly, teacher resource books Shakespeare Set Free, and exhibition catalogs. The Huntington Library, Art Collections and Botanical Gardens (or The Huntington) is an educational and research institution established by American railroad magnate Henry E. Huntington in San Marino, California, USA. In addition to the library, the site houses an art collection strong in English portraits and French eighteenth-century furniture and botanical gardens that feature North America's strongest collection of cycads. The John Carter Brown Library is an independently funded research library of the humanities located on the campus of Brown University in Providence, Rhode Island. The Library is recognized as possessing one of the world’s finest collections of rare books and maps relating to the European discovery, exploration, settlement, and development of the New World until circa 1820. The Morgan Library & Museum (formerly The Pierpont Morgan Library) is a museum and research library in New York City. It was founded to house the private library of banker and financier John Pierpoint Morgan (1837 - 1913) in 1906, which included, besides the manuscripts and printed books, some of them in rare bindings, his collection of prints and drawings. The library was designed by architect Charles McKim from the firm of McKim, Mead and White and cost $1.2 million. It was made a public institution in 1924 by his son, John Pierpont Morgan, Jr.
↑ Thomas Jefferson's Library. .Library of Congress'. Retrieved July 4, 2008. ↑ Thomas, Library of Congress. Retrieved July 4, 2008. ↑ Georgianna Ziegler, "Duty and Enjoyment: The Folgers as Shakespeare Collectors in the Gilded Age," Shakespeare in American Life, Virginia and Alden Vaughan (eds.) (Washington, DC: Folger Shakespeare Library, 2007), 108-109. ↑ Infinite Variety: Exploring the Folger Shakespeare Library, Esther Ferington (ed.). (Washington, DC: Folger Shakespeare Library (distributed by University of Washington Press, Seattle), 2001), 16. ↑ Also see "Founding the Library" on Folger website. Retrieved May 31, 2008. ↑ Kathleen Lynch, "Folger, Emily Jordan," American National Biography, Jon Garty and Mark Carnes (eds). (New York: Oxford University Press, 1999, volume 8), 167-168. ↑ Heather Wolfe, (ed. and compiler), "The Pen's Excellencie": Treasures from the Manuscript Collection of the Folger Shakespeare Library. (Washington, DC: Folger Shakespeare Library (distributed by University of Washington Press, Seattle, 2002), 10 for total number, pages 51, 151, 183, and 196 for Elizabeth I, Donne, Twain, and Whitman. ↑ Infinite Variety, 95; see also "The Collection" on the Folger site. Retrieved May 31, 2008. ↑ "Helen Hayes Awards and Nominations" list on Folger site. Retrieved May 31, 2008. ↑ The common appellation of The Huntington may also refer to the Huntington Hospital. Garraty, John A., and Mark C. Carnes. American National Biography. New York: Oxford University Press, 1999. Private Libraries Association. The Private Library. Pinner, Eng., etc: Private Libraries Association], 1958. Wroth, Lawrence C. The First Century of the John Carter Brown Library: A History with a Guide to the Collections. Providence: The Associates of the John Carter Brown Library, 1946. This page was last modified on 2 June 2015, at 15:28.